The Eye of Ra tattoo, sometimes called the Eye of Horus tattoo, is an Egyptian symbol still commonly seen today. The Eye of Ra symbolizes the Egyptian god of the sky (sometimes referred to as simply the sun god) and his ability to both watch over and observe the things you do. It is also said to symbolize light and all good things as well as ward off evil spirits. Other names attributed to this symbol include Wedjat and Oudjat. An Eye of Ra tattoo serves as a symbol of protection and healing. It is typically represented as an elongated eye with a line above it to depict the upper lid and two or three other lines branching below the eye that stem from the outer corner and give the appearance of the hawk eye. It is frequently seen in color (especially green and blue) and the tribal style of just black and white. Of course, there are several variations on this design based on the creativity of the tattoo artist and the recipient of the tattoo. The eye represents the right eye of Horus, the eye that was plucked from Horus as he fought his brother Seth for the throne after Seth killed their father, Osiris. Horus, the god often depicted as a falcon or a man with a falcon's head, was also the son of Isis, and the right eye, the sun eye, was unharmed during the battle. Another god prepared the eye after the battle and Horus offered it to his father. It brought him back to life and thus it became known as a healing symbol, and Horus became known as a protector of the Egyptian people. From there, the Eye of Ra symbol was placed with mummies and worn as jewelry. Although they aren't actually tattoos, the Extrasensory Perceptions Guide has a few great images of the Eye of Horus that could be used for design inspiration. 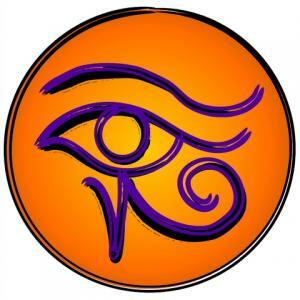 There are two variations of the Eye of Ra tattoo at Tribal-Celtic-Tattoo.com. One is a simple all-black tattoo, and the other is a red and green tattoo with a black tribal-inspired ring around it. Tattooique has an intricate Eye of Ra design. The eye is surprisingly realistic and is the focal point of a larger-scale tattoo featuring an ankh and wings. Tattoos by Design has multiple designs, including the Eye of Ra with wings and a tattoo of Horus as a man with a falcon's head. Please note that to view the full size images, you'll need to pay a fee. Common placement of the Eye of Horus tattoo is the shoulder blade or the chest. However, it can fit nicely anywhere on the body as the size and intricacy of the design are easy to manipulate. You don't need a very detailed Eye of Ra to get the symbolism that comes with it, but if you want a very large tattoo, it can become a complementary part or a focal point of a larger tattoo. Musician Robbie Williams has the Eye of Ra on the back of his neck. 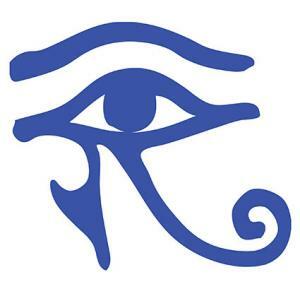 If you love Egyptian symbols and mythology or want a tattoo that symbolizes protection and all things good in life, why not consider the Eye of Ra design? You can choose one in black and white or one with color (full color or even highlights of color). Or, simply opt for a traditional design or tweak it a bit yourself or with the help of your tattoo artist. To better display your personality, consider other items you'd like to incorporate into the design or fit in the designated area.